This week’s Judge of the Week serves as one of the Regional Captains of the Midwest, where he has wowed his peers with one of his mentoring tools. He learned that what happens in Vegas stays in Vegas. And he has recently become the proud owner of the Power Nine. Grab yourself some sushi and scotch and learn all about Maximilian Schroeder! Judge start date: July 30, 2011. Favourite card: Blast from the Past If this card is not in your cube, go get one. NOW. Least favourite card: Mindslaver If masochism/anti-fun is your goal in Magic, look no further. Favourite format: Cube Draft by far, Vintage and EDH are tied for a close second. Commander General: I have 3 at the moment: Sidisi, Brood Tyrant, Ghost Council of Orzhova, and Narset, Enlightened Master. Favourite non-Magic Game: Chess. I have a deep-seated fascination with the game, being a computer science nerd. I even wrote my own chess engine my senior year of college. Best tournament result: 10th at SCG St. Louis 2009 (coincidentally, the very first Star City Games Open Series Weekend). 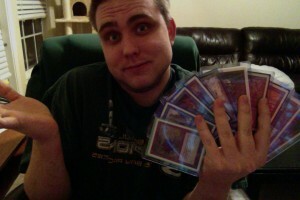 If you want to see my list, you can go here: http://sales.starcitygames.com//deckdatabase/displaydeck.php?DeckID=30630. Note that sweet Lich’s Mirror sideboard tech for Turbo Fog (in all honesty, it was because I couldn’t afford the $50 Baneslayer Angels at the time). Random fact about yourself: I am quite fond of Scotch. You should have a glass with me sometime. I take it neat, just so you’re aware. Anyway, he told me to take my Rules Advisor exam, which I passed, and then he offered to staff me at a Midwest Masters event run by Pastimes in Collinsville, IL. I apparently screwed up little enough to get staffed on one of James’ PTQs, where he certified me for L1. The rest is history. I was covering the camera table for the Finals of Grand Prix: Kansas City 2013, and the players were going to game 3. The match-up was Birthing Pod against Living End. The Living End player kept a hand with 2 Faerie Macabre, which served as his main hate for the Melira, Sylvok Outcast/Kitchen Finks/Viscera Seer combo. The Pod player Thoughtseized one of the Faerie Macabres and eventually assembled his combo on turn 5-ish. The Living End player, seeing the combo on board, just sighed and shook the Pod player’s hand, conceding the match…realizing seconds later that he had the answer to the combo in his hand. Needless to say, the coverage booth and I were a little flabbergasted when we saw it all happen. I was in a state of utter confusion for a solid 30 seconds before I finally came to my senses and realized that the Living End player basically gave away $1200. Judging has played a critical role in my ability to “expand my horizons”. I may not look it, but I’m an introvert at heart, so trying new things and meeting new people was a struggle for me growing up. Judging gave me the opportunity to meet a ton of new people, see a ton of new places, and try new things that I might not have had the courage to try myself otherwise. Being a part of a global family that’s always gathered to some extent at tournaments is a tremendous benefit and it’s helped me a lot with branching out. I’m much more comfortable around new people and traveling solo to new places, and I’m even trying new cuisine that would have otherwise been blacklisted in my earlier years. Oh, the judge program may or may not have gotten me addicted to Sushi. Pretty sure that still counts as a positive influence, though. You were nominated as part of the new Judge feedback process. What do you think of how that system has started up? I was actually quite surprised that I received a nomination. I’d be lying if I told you the emails I got from Sean Catanese and Steven Briggs after the fact didn’t give me a huge case of the warm and fuzzies on the inside. I’m excited to see where this system goes for feedback on judges in general, whether good or bad. It used to be that anytime someone wanted to give feedback, I’d route them to my RC. This process makes things a lot more direct and it allows for much better response time since we now have a dedicated channel in place. Hopefully, we’ll start to see a lot more anonymous compliments like this in the future, since appreciation from players goes a long way in boosting a judges morale. A lot of judges joined the judge community in the first place to give back to their local Magic player base – there’s few things more satisfying than the voiced approval of those you’re supporting. I enjoy seeing all of the friends I’ve made because of Magic, both inside and outside the Judge program. I look forward to going to events because it gives me a chance to see these people from all over the world that I wouldn’t get to see otherwise. Plus, each event is an opportunity to make someone’s day. The feeling you get knowing that you helped to make a Magic event a special experience for a player is awesome, even if it was just holding a simple conversation with them or trying to cheer them up after some bad beats. Showing players that you have a vested interest in their experience goes a long way. Relax. You will make mistakes when you’re out on the floor. You’ll always find something you could have done better, or that you should have done but didn’t. No mistake is ever the end of your tenure as a Judge. We won’t respect you less for it, and we won’t hold it against you. Just own up to it, put it behind you an move on. If you find any judge, regardless of level, who says they’ve had an event where they didn’t make any mistakes, they’re lying to you. We have a swath of amazing players who attend events frequently at our local shops and even spawn events of their own to grow interest in particular formats (Monday night Legacy at my local LGS is a player-driven event). Plus, we have some stellar TOs in Steve Farrell and Lloyd Dodson – those guys run tight-ship, no-nonsense events that are timely and enjoyable for everyone involved. They’re highly regarded by the players in the community and we are very appreciative of everything they do to make their events awesome. I’ve recently become addicted to tabletop gaming (read: board games, etc). Some of my favorite titles include Ra, Betrayal at House on the Hill, Age of Empires III: Age of Discovery, Skull & Roses, and Arkham Horror. If you haven’t gotten into tabletop gaming yet, I’ve got some great recommendations to get you started. They’d include: Seasons, Pandemic, Letters from Whitechapel, Blokus, The Resistance, Coup, Citadels, Puerto Rico, Red7 and Sheriff of Nottingham. At Grand Prix Vegas 2013, on the Friday night before the main event, I convinced another judge to go play $5 Blackjack with me (he never played Blackjack before). I basically told him to set to my right, do everything I told him, and we’d win. An hour later, we were both up $125. We decided the most appropriate thing to do was ride the Moonshot on top of the Stratosphere (the casino where we were playing). It was about midnight, so the strip was all lit up – it was the most amazing combination of awe and sheer terror I’ve ever experienced in my life, all at 1100 feet above the strip. And it was paid for courtesy of the House. Thanks, House! What has been your favourite Magic event that you’ve judged? How about played in? Judged in – definitely Grand Prix: Las Vegas 2013. 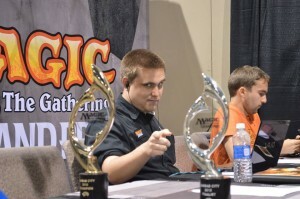 The whole week surrounding the event and the event itself were the most fun I’ve ever had at a Magic event. 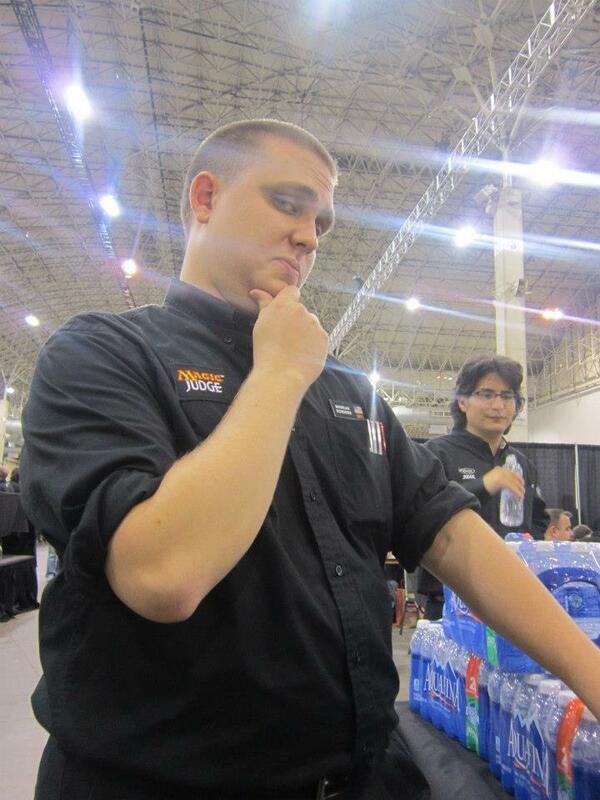 I’m hoping to make it happen again this year for Modern Masters 2015! Played in – Gen Con 2014 Vintage for Sheets side event. Probably not the most prestigious of events, but it was my first ever sanctioned Vintage event! There were 33 players and I made top 8 with Blue Oath. Can’t say I’ve ever had as much fun playing in a Magic event. What is your favourite “after event” story? After Grand Prix: Las Vegas 2013 (imagine that), the TO, Tim Shields, rented a ballroom for the event staff, complete with a catered desert bar and boxes upon boxes of 15 and 18 year old Scotch and Irish Whiskey. He also gave us the leftover Day 2 stamped product and ton of sleeves and said “This is for your hard work this weekend. Go draft and have fun!.” Needless to say, I had fun. 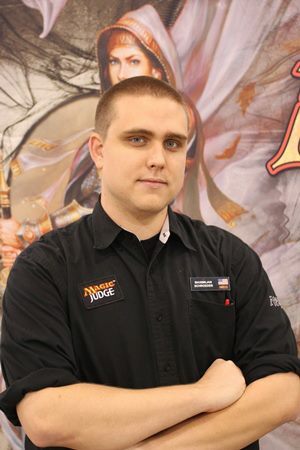 What shenanigans might you be up to if you are selected to help judge GP Vegas 2015? I’m pretty sure I’ve gotten a GPE: Looking at Extra Cards in almost every single Competitive REL event I’ve played in (all accidental, of course). The most recent of which was when I went to sideboard for game 2 and grabbed the deck box of the person sitting next to me instead of mine and proceeded to look at his sideboard instead. Whoops. Duke Men’s Basketball coach Mike Kryzewski. As an avid Duke Blue Devils fan, it’s basically the dream to meet the legendary Coach K. He is the best coach in college basketball history (not named John Wooden) and I’ve been in love with the sport since I was old enough to fill out a bracket. Probably playing tabletop games with my local group more frequently. Perhaps even continuing to work on one of my own games that’s been in progress for some time now. What more can you say about that tabletop game you’ve been working on? It started out as a simple bidding game concept that I’ve touched a few times a year for the past few years. I’ve recently made some notes about changes I want to make that would almost completely reinvent the game from the last testable iteration I had of it. The flavor concept is that the players are members of a thieves guild and in addition to trying to steal valuables for your guild, you try to claim the largest share of the spoils from the collective thefts. At the moment, everything is in shambles to the point where I couldn’t really give any specific details to the game mechanics or layout, but I do plan on making this a print-and-play at some point. Bridge From Below in a graveyard with the opponent’s Yixlid Jailer dying. It happened once at a Vintage tournament I was judging in 2012 and I couldn’t figure it out for the life of me at the time. It’s probably not the most ridiculous scenario I’ve ever seen, but it sure felt like it. Bridge from Below is not exiled. Because its triggered ability belongs to a class of triggered abilities known as “Leaves-the-battlefield” abilities, the game uses the information of the game state (the existence of objects on the battlefield, etc) prior to the event causing the ability to trigger rather than the game state immediately after the event. Before Yixlid Jailer left the battlefield, Bridge from Below had no abilities. Therefore, its second triggered ability will not trigger. Probably a Centaur, since I strongly identify with the Selesnya Conclave and that’s probably the most “Selesnya” creature type I can think of. (Casey Brefka done stole mah creature type! Rawr… but his token is freakin’ sweet, so it’s all good. Watching my protege, Billy Gilmore level up at Grand Prix: Omaha 2015. He and I has been working together for the better part of eight months, and after a close call at Grand Prix: Nashville 2014, he passed his L2 despite having some otherworldly sickness the entire weekend. It was awesome to see all of the hard work and effort he put into his own self improvement finally come to fruition. What character in Magic (real or fictional) represents you the best, and why?I’m not so sure I identify with any one character in particular, but I’m very much Selesnya at heart. I prefer to keep the peace and keep things chill, but if you want a scuffle, I have no problem bringing the hurt. One of your claims to fame was highlighting the Judge Box. Explain to readers what it is, and how it’s worked out for you. I got the idea from Pete Jahn , a L2 from Wisconsin, who introduced it during a seminar on mentoring new judges and judge candidates. He lit a spark and I built one as soon as I got home. I’ve been tweaking it ever since and adding to it occasionally. A “Judge Box” is a box of cards, but they’re organized in such a way as to allow a judge to create a contrived game state that demonstrates a particular concept of Magic rules/policy. This makes the illustration and demonstration of concepts much more engaging and effective for people involved, and it gives your judge candidates a tangible way to recreate the concepts they learn about through the mentoring process. It’s been a huge success for me thus far – I’ve used it everywhere from my local shop to multiple Grand Prix to mentor prospective judge candidates (some of whom have even put together Judge Boxes of their own). As one of the Midwest Regional Captains, what are your duties? What have some of your most interesting experiences in that role been? In essence, I’m a liaison for my Regional Coordinator, Steven Briggs. Any particular matters involved in the state of Missouri, such as judge problems/TOs looking to staff an event/etc are passed down to me so that I can more effectively expedite these processes. I also communicate with Steven Briggs on a monthly basis to give him updates on the state of the program within Missouri, including any new certifications/prospective L2 candidates/accomplishments/etc. What are your goals in the program for the next year? The next five years? My goal for the next year is to complete my L3 checklist. At this point, the only remaining items I have are ones that I haven’t completed because I’ve been very busy lately with a new job and relocation. I want to at least be eligible to Team Lead at a Grand Prix this year, and if I can have the opportunity to Team Lead, so much the better. As for 5 years down the road, I would like to have certified at least another 5 L2s in the state of Missouri (this obviously involves me reaching L3 at some point). St. Louis has a major judge experience deficiency right now for how much the community has grown in the last few years. Eventually, the current level of judging experience their will become unsustainable. I’m hoping to put St. Louis (as well as the rest of Missouri) in a comfortable position of judge availability as opposed to just scraping by. You recently managed to trade for a set of Power. Why did you do it, how’d you do it, and what are you going to do with the set now that you have completed it? Ah yes…the Power 9. Magic‘s Holy Grail, as it were. Let’s start with the why/what am I going to do with them, and then we’ll cover the how last. These cards have always been held on a pedestal of legend for me and my friends, and it feels like the ultimate achievement as a collector to finally own a set. 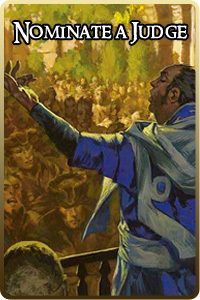 When I realized that owning Power was a possibility for me, I decided that I was going to make it a goal to attend Eternal Weekend and play in the Vintage and Legacy Championships – the Vintage deck I chose to build was the one I borrowed for the Gen Con 2014 Vintage for Sheets side event, Blue Pitch Oath. It’s basically my dream tournament as a Magic player. I hopped into trading quite aggressively, picking up about 5 pieces (including the Lotus) in one massive trade (I ended up deferring most of the trade value for future power, since the person I traded with didn’t have much power at the time, but he acquires it quite frequently and readily). From there I just gradually pursued the remainder until I grabbed the final three pieces just before the recent price spike. Time Vault is better in every regard. It goes in every deck and it (almost always) wins the game on the spot with Voltaic Key/Tezerret, the Seeker/Ral Zarek. I play Blue Pitch Oath in Vintage, which does not play or have a need for a Timetwister. The only decks that play Timetwister anymore are Wheel-Storm decks, and those decks are poorly positioned in the format due to the ubiquitous presence of Flusterstorm and Mental Misstep. Library of Alexandria, though probably not as good as Timetwister in a vacuum, is basically Power in function and in price. With that said, I will probably pick up a Timetwister at some point in the future for the sake of owning one, should I ever decide to run it in a deck later on. For now, I have no need for it. As for the how, the distribution of the promo Force of Wills played a huge role in getting me to my set. I had stashed away a good deal of comp from previous events, not having anything better to do with it at the time, so I started running some numbers to figure out what trade value I had on me. When I realized I could get almost an entire set of Power just in trade, I decided to make some deals and go for it. When all was said and done, I had traded several Judge Foils (including Force of Wills and the Basic Lands), 2 sealed boxes of Modern Masters, a sealed box of Return to Ravnica, and cash over the course of five months into my set of Unlimited Power. Perhaps I’m a little crazy for doing so, but I’m happy with the result. What do you think is your biggest strength as a Judge? What do you think is the area you most need to work on? I think my biggest strength is my ability to interact with players, reagrdless of their current mental state (be it happy, neutral, or quite pissed). I’m able to hold my own with them and diffuse escalating situations when they start to get out of hand (though, fortunately, those are pretty rare). I think the usual “in-passing” interactions with players are more important. It shows that we can be amiable and relate to them, even though we are in a position of authority at the time. Having some simple conversations with players in between games or outsides of matches is a great way to “get on their level” and allow them to be more comfortable with interacting with judges. After all, that’s what we want them to do whenever they need us. As for an area of improvement, I’ve always thought my weakest point was Investigations – specifically knowing when to pull the trigger in scenarios that aren’t so clear cut. I’ve had DQs before that are as textbook as they come, but there have been those that are purely judgment calls. I tend to err on the side of caution when I’m uncertain, but I’ve learned from shadowing others that this isn’t necessarily the best MO. Investigations is pretty much only improved through practice, which makes it kind of difficult to consistently work on; but my best piece of advice would be to always pull in another judge as a sounding board. Odds are, if they have a feeling something’s up as well, you’re heading down the path of a DQ unless the subject in question presents a very good reason for not doing so. I studied abroad in Hong Kong for four months when I was a sophomore in college. I signed up for the student exchange program completely on a whim (because my roommate at the time told me he was going to do it and that I should too) – it ended up being the best decision I ever made. Seriously, if you ever get the opportunity to study abroad, do it. You will not be disappointed. 2. I have caught all 151 Pokemon on Red Version with no trading or GameShark. The last five sanctioned Magic events Minh played in date back to only 2011.